These amazing animals should be protected, not hunted. It's outrageous that sound scientific advice was thrown out the window in order to rush through plans to open critical habitat to trophy hunting. Fewer than 150 of these animals existed in the lower 48 by the time they were protected by the Endangered Species Act in 1975. While the number of animals is now nearly 700, they have been unable to reconnect to their populations in Canada and Alaska, leaving the Greater Yellowstone population genetically isolated and vulnerable to habitat loss and major climate change impacts to the bears' most important food sources: elk, cutthroat trout, whitebark pine seed, and army cutworm moths. Wyoming wants to charge tourists $6,000 to hunt a grizzly, and the Wyoming Game and Fish Commission is currently plotting where to allow hunters and their guides to track down and kill this important, top-level predator. 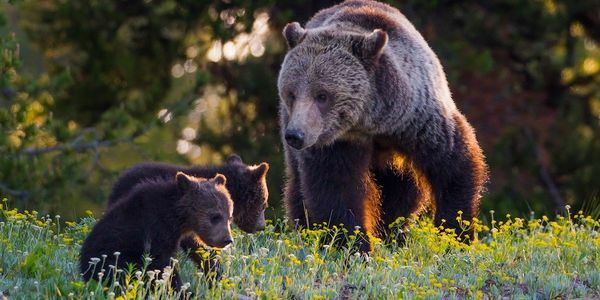 Tell the Wyoming Game and Fish Commission that grizzlies aren't a cash crop! Only a massive outcry has chance of convincing leaders in Wyoming to end their plans. Help send a message that grizzlies are more valuable as protected wildlife, not trophies mounted in some hunter's den. Big news! Montana recently announced they would NOT start a grizzly bear hunt this year. Now we need to INCREASE the pressure on Wyoming to do the same. Nearly 250K Care2 members have signed - AMAZING - Can we hit 300K? Share the petition now with your friends who love animals! Read about MT's decision (and our petition) here.